I have spent the last 20 years collecting cookbooks. I remember moving a few years ago and having a haul-away company come clean out old junk from my basement. I made the mistake of going to work that day and not supervising what they “hauled away.” I came home that night to find that a big box full of cookbooks was missing… tragic. Fortunately, none of my favorites were in that box and it hasn’t hindered my collection too terribly. I love to collect books signed by the Chefs. I’ve been fortunate to have met Jacques Pepin, Emeril & Carole Walter through work over the years. I also have signed books from Lidia and Giada. For whatever reason, I just like collecting them… it makes me happy. I think if you make one great dish from a new cookbook, it’s a good one. All of us have cookbooks that we’ve purchased, thumbed through and put on a shelf, never to make a single recipe. I read cookbooks like novels. There’s always one by my bedside table. 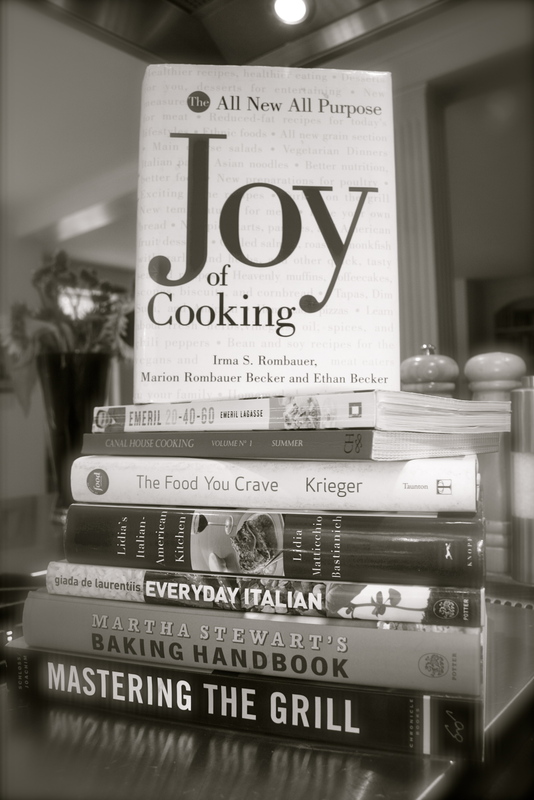 I have a small group of cookbooks that are like bibles in my kitchen. I have made many successful recipes and they’ve become repeats at our family table. That’s the sign of a great cookbook! Here is what sits on my cookbook shelves. Complete Book of Soups & Stews by Bernard Clayton, Jr.